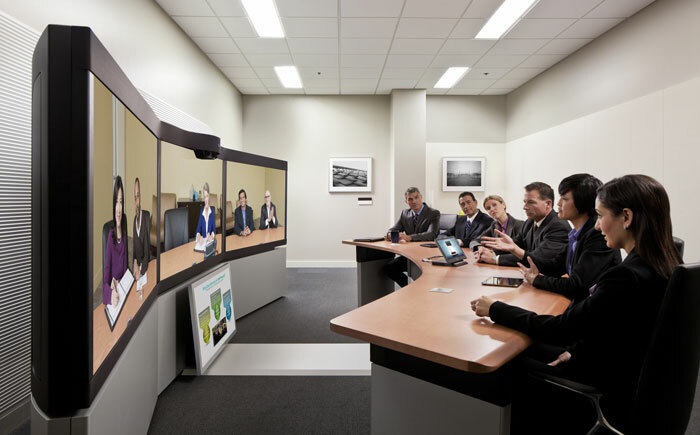 The first time I experienced any form of telepresence was probably 10 years ago at a Cisco Systems office. They produced a hi-tech corporate teleconferencing room that was and is fairly expensive but unique in how it makes the room participants feel connected to one another. It worked by connecting like rooms together. For example I was in a teleroom in Vancouver connected to identically equipped and designed rooms in various US cities and we were able to see each other and our voices were heard in relation to where we sat. The cameras would auto focus on the speaker. Participants could present from any of the rooms to all participants. That was than but the world has changed, dramatically. Do you remember when Sheldon on the TV show Big Bang Theory confined himself to his room and would only ‘come out’ as a telepresence robot? Well, I was at a conference this past week in Montreal, an historic city in Quebec eastern Canada and at one of the evening networking events, a colleague from a local Vancouver software company was telling me about a telepresence robot they bought for a couple of thousand dollars. I didn’t believe him at first but then he said “let’s install the app (Double) on your phone and I’ll show you”. So, we downloaded the app, he logged into it, and we were connected from Montreal to the robot in his office in Vancouver. The robot from Double Robotics is a Segway with a ‘neck’ that can go up or down, and an iPad for a ‘head’. He ‘walked’ it around the office introducing me to a couple of his staff who were working late. The robot’s head showed what’s on my iPhone’s front facing camera, ie my face. I could see what the robot ‘sees’, displayed on my iPhone’s screen. We pushed a button to ‘see’ the ‘feet’ of the robot – the iPad ‘head’ uses the rear facing camera off a mirror to ‘see’ down at the foot of the robot. This way you can remotely see what obstacles there might be in the way. They use this telepresence robot to support their employees that work from home a few days a week. They have an understanding that whoever uses the robot last has to put it back where it belongs, near the wall charger. Kind-of like kids having to put their toys away. I wonder how a tool like this might support learning. Perhaps schools will one day have a few of these telepresence robots available for kids to use when they are at home sick, in the hospital, or traveling with their families. They could be assigned a robot and use it to attend classes, learn with fellow students, participate on the debate club, attend an assembly, and hang-out with their friends. The remote students could present via their robot’s ‘faces’, sharing what they’ve learned. They could even present a learning app on their ‘face’ for other students to interact with and contribute to. Perhaps there will be classroom spaces in schools dedicated to distance learners, each one who is associated to a telepresence robot. Imagine this classroom for a moment with 25 robots interacting, all controlled by students from a distance. It’s an interesting possibility. Perhaps this approach mixed with digital immersive learning environments will begin to support very flexible versions of ‘school’. Coincidentally in my inbox this morning I found a TED Talk video where a gentleman presented via his surrogate telepresence robot. This man is confined to a bed as a mute paraplegic due to a stroke-like illness that struck him when he was 40. You have to watch this to truly understand the game-changing possibilities of this technology in supporting disabled persons. He also learned to control quad-copters and flies them around his house and yard looking at the garden, checking the roof solar panels, etc. He even controls coptors in a lab 3000 miles away from his home, where he works with researchers to further this important work. The world is ‘small’ via the Internet. Check out the video below. I’ve written often about the exponential disruptive changes that technology is driving in our world. The Internet has done more than any other technology to speed up change by connecting human beings to all other human beings where their ideas mix, mate, and mutate. We were asked by a keynote speaker this week what we felt would enable students to learn at the pace of change. I was surprised by the lack of comments by those attending, about technology’s role in this. I tweeted about the importance of global connections. I later referenced Steven Johnson’s book ‘Where Good Ideas Come From’ ow.ly/27OBDP. He delves into great detail about how connections, whether intentional or serendipitous, generate the most and therefore the best ideas. Ideas drive change. If ideas and their humans never meet and mix, they will not generate the important changes they relate to. I believe that students must learn to connect digitally and globally to learn at the pace of change. I believe that we do a disservice to their learning and potential when we downplay, diminish, and underfund their digital connection to others around the world as part of their learning. I’ve noticed that some people are abandoning Facebook or Twitter, or at a minimum, removing the apps from their smartphones. A colleague of mine was finding it difficult to focus in the present when with real people while his smartphone buzzed with new Facebook and Twitter posts commanding his attention. My eldest son disabled his Facebook account – he found that he was wasting too much time there, not getting to important things. We were chatting as a family recently about how ‘friends’ build up in Facebook and talked about deleting all those who aren’t really friends (or family) – I did and so did my second son – it reduced the noise level. Add to the mix Twitter, Google +, Pinterest, LinkedIn, About.Me, Flickr, Diigo, Yelp, Skype, Strava Cycle, Prezi, Instagram, and it does tend to become overwhelming doesn’t it. However, I think social media tools are super useful for sharing, learning, and staying in touch, but users of these must learn to self-regulate their use. They must make good choices about what content they will engage with and contribute. These tools are not going away any time soon and they can be leveraged for good use. I like Facebook for keeping informed and in-touch about distant family members and friends. Many of them I see rarely so this is a great way to stay connected in some way. Twitter for me is my learning and professional network. I enjoy posting thoughts and quotes from books or articles I read and from learning events I attend. Other tools serve specific purposes for me in sharing my learning, knowledge, and ideas. It’s fun to engage intellectually with others around ideas. It must be overwhelming for parents of pre-teens and teens faced with the deluge of the digital realm. My kids are in their 20’s now so the options and usability of social media was limited when they were young. They did get caught up in the Facebook craze and didn’t always use it digital footprint appropriate ways. I remember once, my youngest son unfriended me when we had an argument in the real world. I worry about parents who avoid using social media tools. It would be unwise for their kids to be in these tools without their parents knowledge and guidance. A parent wouldn’t give their 16 year old the keys to their car and let them drive away without teaching them to drive. Why do parents so often do the equivalent in the social media world? I believe every parent should be on Facebook, Twitter, and the other tools becoming familiar with their purpose and uses both for good and for bad. They need to have critical conversations with their kids about these tools, about what can go wrong, why they need a positive digital footprint, what a digital footprint is (mine shown below), that the Internet is written in pen, not pencil, etc. I recently gave a social media presentation to a group of parents at the church I attend. I was disappointed with the turnout given the relevance of the topic. Either all the parents know everything they need to about social media, or they didn’t think it worth their time to learn. I hope it’s the former and not the latter. Our schools are increasingly faced with more tech savvy kids armed with powerful digital mobile devices. Besides their homes, kids aught to learn practical, safe, appropriate skills and behaviors at school for navigating the social media world successfully and developing positive digital footprints. Embrace the new, learn its power, apply it for good! Once upon a time, people who could learn to read, write, and calculate were deemed competent to participate in the democracy, work in a factory, and live the good life. Don’t you just long for the simplicity of that era? Some days, I think I do. Our fast paced world where “[c]hange is accelerating, to the point where it will soon be nearly continuous” (Present Shock: When Everything Happens Now) is not simple, and old competencies are the very basic minimum requirements to prepare a person to fully participate. Our world has changed dramatically since the days when learning was simple and slow. Competence (or competency) is the ability of an individual to do a job properly. A competency is a set of defined behaviors that provide a structured guide enabling the identification, evaluation and development of the behaviors in individual employees. A key responsibility I have in my role as CIO is to develop and lead an IT group. Overall, I am impressed with my current group and their abilities but I need to consider how to prepare them for the future and enable them to progress to meet new requirements. We need highly competent people so that the services we provide to schools and our business are of high quality and provided in a timely manner. Traditionally (and currently) IT people are judged based on what certifications, diplomas, or degrees they have along with some number of years of “relevant” experience. I think the pace of change we face now is rendering this method of qualifying people, basic. Being certified in some specialized technology might tell us what someone is capable of at that point in time with a specific technology. However, it doesn’t indicate their orientation and attitudes to learning and their ability to “learn, unlearn, relearn” (Alvin Toffler) which is essential when the technology IT people work with is invented, purchased, installed, configured, maintained, and replaced on an ever shorter time span. Having a degree or diploma tells us that a person should be able to learn, possibly work with others, and that they can think. This is a good start but no longer enough, in my opinion. As the technology in schools we call “computers” begins to disappear and solid state self-healing, self-diagnosing, mobile devices take over, the traditional work of installing and maintaining computers will all but disappear. Installing software has shifted from a complicated problem fraught task to one where you queue up remote push methods and software simply appears on devices (even computers) based on a stated schedule. Software (app) installation is also now substantially a pull model where the users of the device can select items to download and they do and are available to use almost instantaneously. It gets a little more complicated for large organizations with volume purchasing, managing application sprawl, etc. but the technicalities are simplifying rapidly. In a BYOT context, what’s there for an organized IT group to do in providing software and support beyond the ‘back-end’? I think IT people will need be more empathic, more able to help clients use technology effectively, give advice, design and recommend methods and solutions, etc. They will need to be more learned in the domain of knowledge their clients have – in our case, teaching and learning practices. They will do less traditional technical work and more analyze and guide type work. IT people in the field will need to be authentically interested in how they are able to help people, to make them feel, as they assist them with technology. Our IT staff who manage the sophisticated ‘back-end’ systems such as server farms, enterprise storage, backup/restore systems, network switches, network optimization, firewalls, wireless networks, web platforms, workflow engines, design, architecture, project management, etc., are finding the pace of change to be very challenging. Their skillsets and competencies are quite different from those working in the field supporting end devices. A certification today and some experience might not be a good measurement of competence when filling these roles. Deep knowledge, relevant experience, and an orientation to detective work, problem solving, creative thinking, solution finding, design, and development, will all be important attributes to have and seek. Additionally, pressure will continue to mount to move some of this workload into ‘the cloud’. Our current privacy law makes this difficult in public education but I believe this is temporary. In the future, we will have to be very strategic with what we run in-house vs leverage in the cloud. Assuming we have a clear sense of the roles and positions we need to meet the needs of our ‘business’ and a clear understanding of the competencies we need, then we need a transparent way to assess people for these. We need to be clear about what a person needs to do and know to demonstrate the competencies required for a particular role. What training should the organization provide and what professional learning should individuals be expected to invest in personally? I think there’s got to be a balance here. Essentially we need people to have an orientation toward being agile learners, people who strive to learn quickly, invest in learning continuously, and be able to change focus when needs change. We need our IT people to understand deeply how to leverage networks, whether these are small work teams, cross functional teams, or the Internet community at large. Working in isolation as IT people often prefer, won’t cut it in this new disruptive fast paced extreme learning world we now live in. The Career Framework provides Managers, Directors and HR Representatives with a one stop shop to making the recruiting, hiring and career development processes easy and efficient. We live in unprecedented times and they are ever rapidly changing. We should never get comfortable with what we know, what we are skilled at, our attitudes, and behaviors. We should continuously self-evaluate and adapt to the changing world around us. We risk obsolescence if we accept status quo. Learn fast, learn always, learn fearlessly.